Ranger is a file manager for the shell with vi keybindings. Its interface is similar to the Finder in Mac OS X. You can move up and down files or directories in the current path by pressing j and k. To move to parent directory use h and to open the directory or file currently highlighted press l. These navigation keys should be very intuitive for the vim user. Ranger can also utilize many other tools to show previews of many types of files. 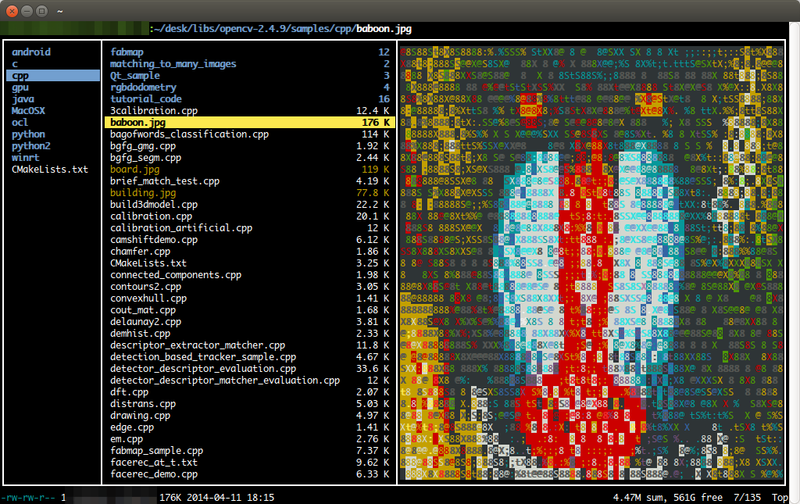 This is really useful because you can see previews of source code, contents of zip files, text inside PDF files and even ASCII rendering of image files (JPG/PNG) all from inside ranger in color! Run ranger once so that it creates its default configuration directory in ~/.config/ranger. After that run ranger so that it copies over its configuration files to this location. This is necessary to configure ranger or for it to enable previews. dc: Compute size of directory under cursor. Size is displayed in status line at bottom. Enter: Open in default program. nice i love it. I try to install it on my mac but i have some issu with image preview.